For even just one day, I can do this. One day at a f***ing time. Today’s post is brought to you by: Elk! Elk, in regards to these Medicine Cards, represents Stamina. I think this is appropriate at the moment because it has a great deal to do with pacing, something at which I am terrible. It’s funny how when I’m camping, there is no pacing. You do what needs to be done when it needs to be done and there is no difficulty in doing so. And yet here, in this mess of a house, in this mess of a life, I can’t get anything done that I need to. Case in point, I have probably 2 hours worth of paperwork to do that’s backlogged from about a week ago. There’s no reason it should have gotten this bad. Elk is a good medicine for today and a good reminder for me. Oh, would you look at that! I’m almost up to Leviticus. Gotta get a header ready. Man, even Matthew Henry doesn’t have much to say about this part of Exodus. They should have called this book “Exposition” because once you get past the whole “leaving Egypt” thing, it’s suddenly a catalog of measurements and repeated descriptions. I like the groovy colors on the front gate thing. Basically what I didn’t quite gather from scripture was that this thing was designed to be a portable temple. 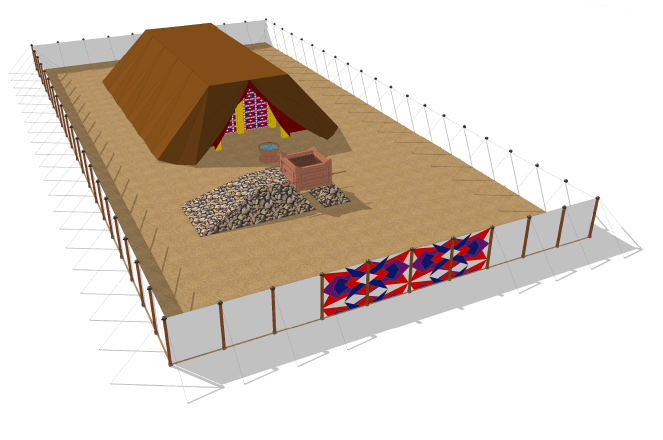 It’s essentially a big cloth tent that can be set up or taken down as the Hebrews trek around the Middle East. Interesting. Anyway, two more days and we’ll finish out Exodus and I will move on to book three of the Bible. Have a good day, everyone. Peace be upon you.